One post about new Main menu was already wrote a few days ago, so we really suggest to check it . What is not visible, is deeper integration with list of the functions. If left panel will be popular, we”ll gladly improve integration to also some of the functions. To add better support for active (sport) people, we finally introduced support for Zephyr and Polar heart rate monitors. 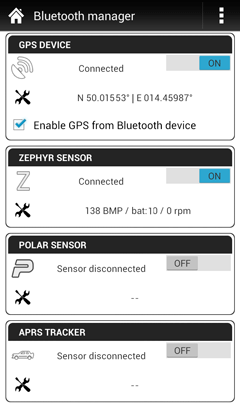 Zephyr sensor is monitor powered by accumulator, that allows to report heart rate, strides, cadence and battery status. All values are recorded and you may see them online casinos on dashboard or are stored into recorded track points. Polar sensors are similar. Polar creators offer wide range of possible devices where most of HRM should work correctly in Locus (we”ll be glad for any feedback here). Support for these sensors is only in Locus Pro version, anyway we decided to add limited possibility to check how this works also into Locus Free. Sensors will automatically stops after 10 minutes of using. Same system is now introduced also for ANT sensor. We received many reports about some problems during downloading Vector maps, in communication with some external add-ons, crashes during track record and many more. All core problems are now fixed. Thanks all for reports!